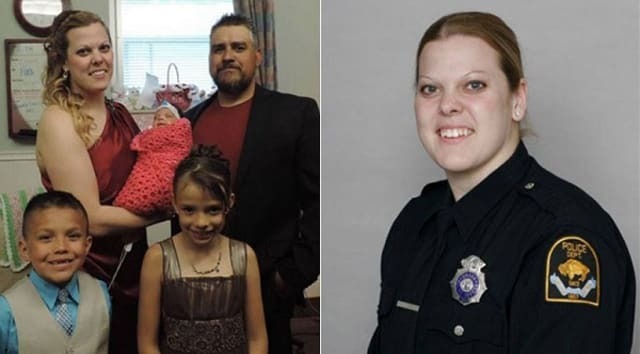 Kerrie Orozco, who was just hours from taking maternity leave after her premature baby was released from the hospital, was the first female officer killed in the line of duty in Omaha. The woman who illegally purchased a gun for her boyfriend, who in turn used the gun to fatally shoot Omaha police officer Kerrie Orozco earlier this year has been sentenced to one year of probation, a federal judge ruled Monday. Jalita Johnson, 26, bought the Glock semi-automatic handgun, along with a 50-round drum magazine and ammunition from a Jonesboro, Georgia, pawnshop in April. Johnson lied on the corresponding paperwork at the time of the purchase, answering “yes” when asked if she was the actual buyer of the gun and not purchasing the gun for another individual. Prosecutors, however, ascertain that Johnson’s boyfriend, Marcus Wheeler – a 26-year-old convicted felon and known gang member prohibited from making the purchase himself – gave her the money for the gun and told her exactly what to buy. The following month, on May 20, Omaha officers were in pursuit of Wheeler, who was wanted in connection with another shooting, when an exchange of gunfire erupted. Wheeler fired a total of nine rounds, one of which struck Orozco right above her bullet-proof vest. Wheeler was subsequently shot and killed by Sgt. Jeff Kopietz during the continued pursuit. Orozco, who at the time was working her last shift before taking a deferred maternity leave days after her premature baby was released from medical care, was rushed to the hospital, but efforts to save her were unsuccessful. In August, Johnson, who initially said someone who lived with her took the gun but later admitted she bought it for Wheeler, pleaded guilty to providing false information to a federally licensed firearms dealer when she purchased the gun. In addition to a year of probation, U.S. District Judge Eleanor L. Ross ordered Johnson to 40 hours of community service and 180 days of house arrest. “The members of the OPOA cannot begin to express the amount of anger, frustration, and sadness this news brings to us,” the union said, adding that Johnson could have been given a $250,000 fine and up to 10 years in prison.